The truck manufacturer said the deal will bolster its efforts to commercialize trucks capable of Level 4 self-driving, in which the vehicle can travel down the road without any driver input or backup assistance, at least within specific areas and conditions. Torc, founded in 2005 by a group of Virginia Tech engineering students, has spent more than a decade developing self-driving systems for vehicles ranging from passenger cars to transit shuttles and heavy off-road equipment. The companies announced the agreement March 29 at Torc’s headquarters in Blacksburg, Va.
Daimler’s deal with Torc comes less than three months after Daum outlined the truck maker’s aspirations to introduce Level 4 automated driving within the next 10 years during a Jan. 7 event held in conjunction with the massive CES technology show in Las Vegas. Moving forward, Torc’s automated vehicle experts will collaborate with existing development teams at Daimler Trucks, especially in North America, where the manufacturer builds Freightliner and Western Star trucks and Detroit engines and components. 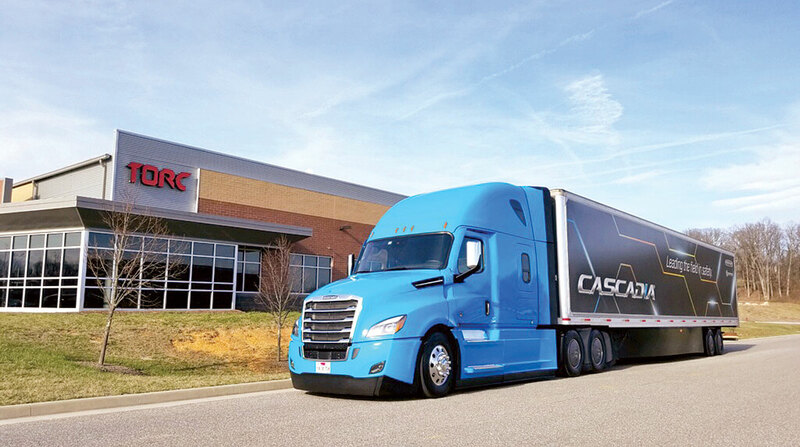 The collaboration with Torc “gives us a chance to make a great leap forward,” Daimler Trucks North America CEO Roger Nielsen said in an interview with Transport Topics. Torc’s experience with fully unmanned vehicles in off-road applications such as mining is “intriguing,” Nielsen said, but Daimler’s focus for now will be on developing Level 4 automated trucks that continue to have a driver on board. These self-driving trucks hold the potential to reduce driver stress and fatigue, boost fleet efficiency and move the industry closer to making accident-free driving a reality, he said. And that work could pave the way for further automation. “Anything we can do to keep a truck safe with a driver in it gets us further down the road to being able to keep the truck safe and the public safe without a driver in it,” Nielsen said. Torc CEO Michael Fleming said he sees a strong business case for self-driving trucks in the United States, especially as freight demand increases. He identified hub-to-hub operations on open highways as the natural first target for Level 4 automated trucking. “We expect that the automated truck will be able to drive itself safely across the road, and if it ever comes into a situation where it doesn’t know what to do, it can bring itself safely to a stop and then give the driver time to get the truck out of trouble,” Fleming said. Under terms of the agreement, Torc will retain its company name, employees and existing customers and facilities. More than a decade ago, Torc’s founders competed in autonomous vehicle challenges held by the Defense Advanced Research Projects Agency, or DARPA. Since then, the company has partnered with Caterpillar to produce self-driving vehicles for mining and agriculture applications and recently announced a collaboration with Transdev on autonomous shuttles. Daimler Trucks, meanwhile, will continue its work on automated driving technology and system integration for heavy-duty trucks at its Automated Truck Research & Development Center, established last year at DTNA’s headquarters in Portland, Ore.
At the same time, the truck maker will collaborate on automated vehicle technology with Mercedes-Benz Cars, its sister company under Daimler AG. As Daimler Trucks pursues Level 4 automation for the future, the manufacturer is rolling out more advanced driver-assist capabilities in the near term. Later this year, DTNA will deliver Level 2 automation with automated steering functionalities on its flagship Freightliner Cascadia model through the Detroit Assurance 5.0 safety system with active lane assist. Several years ago, Daimler helped spark an industrywide conversation about automated driving with its Mercedes-Benz FutureTruck 2025 and Freightliner Inspiration concept vehicles, introduced in July 2014 and May 2015, respectively. In the years since, competition in the nascent self-driving truck business has increased dramatically. Every major truck manufacturer in North America and many of their suppliers also are investing in various forms of automated driving, and a growing number of technology startups have entered the industry as well.